Love grilling? Check this contest out & save the date! 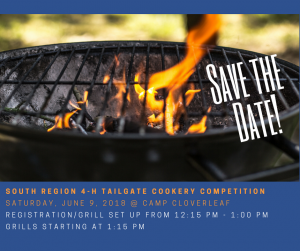 The South Region 4-H Tailgate Cookery Competition will be held on Saturday, June 9, 2018 at Camp Cloverleaf in Lake Placid, FL. Furthermore, Registration/Grill Set Up will be from 12:15 PM to 1:00 PM, with grills starting at 1:15 PM. South Region Tailgate Contest Save-the-date! The purpose of this contest is to promote the use of animal protein in the diet. In addition, youth will learn the art and science of safely preparing beef, pork, poultry, and seafood in an outdoor setting. Investment in this activity provides 4-H youth with life skills, including decision making, healthy lifestyle choices, and communication. More information to come! However, If you are interested in signing up right now, please contact Tish Roland at Troland@ufl.edu. Hello, I am Tish Roland, the 4-H Agent in Collier County. I started working at the UF/IFAS Extension and Collier County in March of 2011.